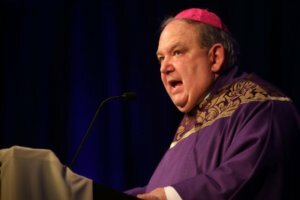 BALTIMORE – Dressed in penitential purple vestments, Cardinal Daniel N. DiNardo, president of the U.S. Conference of Catholic Bishops, led the bishops of the United States in a Mass to open their fall general meeting Nov. 12 here. Unlike most other years when the bishops left the hotel to celebrate Mass in the Basilica of the National Shrine of the Assumption of the Blessed Virgin Mary or another Baltimore church, the Mass was offered in the makeshift chapel set up in the hotel, where they had spent most of the first day of their meeting in prayer and penitence in the presence of the exposed Blessed Sacrament. The day of prayer included readings from the prophet Daniel and Sts. Gregory of Nazianzus and Charles Borromeo and reflections by three lay people and a religious sister, including two people who are victim-survivors of clergy sexual abuse. St. Josephat “was put to death for his steadfast commitment to church unity,” the archbishop said. As the bishops completed the day of prayer and prepared for the coming days of meetings, both prayers are needed. He said the bishops must have love in their hearts for those who have been harmed. He thanked by name the two victim-survivors who gave reflections for the bishops during the day of prayer, Teresa Pitt Green and Luis A. Torres Jr., who were “wounded by their experiences with priests,” he said. The archbishop said that one of his frequent critics in his archdiocese reflects on Caravaggio’s painting “The Incredulity of Thomas,” in which the Apostle is seen putting his finger into the wound in Christ’s side. Archbishop Hebda said he was pleased that Pitt Green and Torres were able to talk about some of the good that has come about in the church since the bishops passed the Charter for the Protection of Children and Young People in 2002, whether in the form of protection of children or in victim assistance. Without mentioning the release of a Pennsylvania grand jury report in August and revelations in early summer of allegations of misconduct by former Washington Archbishop Theodore McCarrick, Archbishop Hebda said the bishops need to be newly attentive to the new layers of the wound that have become painfully evident recently. Reflecting on the Gospel reading, he asked why bishops have been so slow to rebuke other bishops who have abused power and their position to the detriment of the faithful. 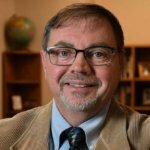 He hopes fear will not get in the way of a process for setting up an in-depth study of the problems that have led to abuse. He said the bishops need to avoid factionalism and promote unity with the whole church. 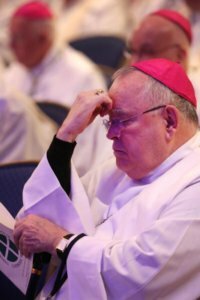 “We need to be bold, we need to be decisive, but we need to do that in a way that serves the unity of the church, not only with the See of Rome but also within the church in the United States,” Archbishop Hebda said. 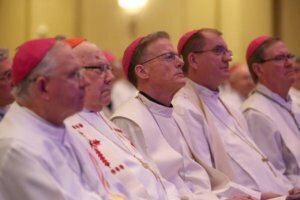 If they find the work ahead difficult, they should keep in their mind the image of Pitt Green and Torres and other victim-survivors who have shared their experiences with the bishops in the course of their pastoral work – “the sheep for whom we, out of love, need to lay down our lives,” Archbishop Hebda said. The Mass included music ministers and a choir from the archdiocese. Deacon Sean Keller assisted as master of ceremonies and Deacon Kevin Reid was the deacon of the Word, while Deacon Seigfried Presberry was the deacon of the Eucharist.